Of all the insurance companies I can think of—the one with the lizard or that girl or that talking box, or whatever—there’s really only one that seems to give a damn about people’s interest in vintage cars. The company is Hagerty, and, let’s be clear, their interest is in making money by insuring classic cars. Even with that in mind, I’m delighted to see it take real steps to bring classic cars to the people, like this recent event that I attended with my 6-year-old son. The event we went to was Hagerty’s inaugural Family Car Fest. And it was great. Hagerty – a global company specializing in products and insurance for people who love cars – held the first-ever HagertyFamily Car Fest, where nearly 100 youth and adults were able to drive and experience a variety of iconic cars. The goal of the event, I was told, was simply to give families a chance to interact with some amazing cars in ways that go far beyond the usual car show or museum. While museums and local car shows cars are great, the cars are presented in the context of untouchable, immobile artifacts, closer to sculpture than a living, air-intaking thing. This event changes that, by providing a bunch of cars for people to drive, including a 1934 Buick Model 91 Club Sedan, a 1951 Hudson Hornet H-145 Sedan, a 1969 Chevrolet Camaro SS, a 1919 Model T and a 1970s Fiat 500. Having a chance to drive any of these cars for people who don’t have the astounding luck to have a job like mine is a very, very rare thing. There were opportunities to drive both on a private road/track, and there was also a two-hour plus road route that the cars could be taken on. One family won the chance to tool around in a massive, be-finned 1960 Cadillac Eldorado. How often can you and your family show up to some free event and get handed the keys to an icon of American motoring? There were also vintage-styled gas-powered go-karts and a little kid’s autocross-like track, complete with pedal cars and Power Wheels to zip around in. Otto thought that was a blast. Same goes for the huge slot-car track they had set up, which was so completely enjoyed by Otto that I’m looking on eBay for smaller slot car setups as we speak. The idea that millenials or whatever stupid name we’re going to call the generation of little kids currently being little kooks aren’t interested in cars is absurd. There will always be a percentage of kids who will become lifelong gearheads, but they need exposure to genuinely interesting cars to light that spark. You can’t expect a kid surrounded by silver and white crossovers to realize how engaging and how much character a car can have. If the most exotic car you ever encountered was one of the Honda CR-Vs that still had an externally-mounted spare tire, then how would you even know what you’re missing? Events like this one show kids exactly what makes vintage cars so amazing. Otto loved every ride in the classics: the Eldorado was immediately recognized as something perhaps designed to fly to moon-diners, the old Buick held the novelty of being in a moving living room, and the Model T was a hilariously entertaining contraption that had the most fascinating horn ever developed by the hand of man. For our long road drive, Otto picked the Fiat 500, because he was delighted to find a car “the same tall as me!” When you’re a little kid, the discovery of a “real” car that’s scaled to you is a revelation. 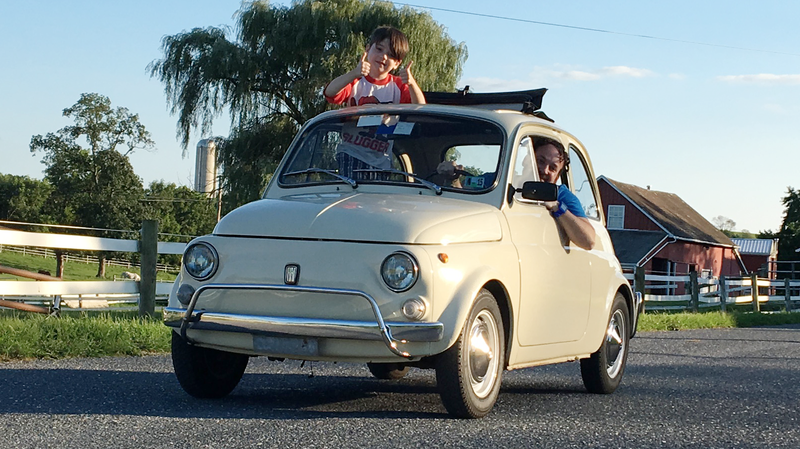 I should mention something about this Fiat—it’s owned and driven by a 9-year-old. That’s right, nine. As in not even ten. The kid is named Sid, and he’s the grandson of Nicola Bulgari, as in the fancy-person watch and luxo-brand Bulgari. Bulgari collects vintage cars, primarily American, and it was largely cars from this collection that was on display and available to drive. Anyway, the Fiat 500 is Sid’s car, and he drives it around, like a pro. Watching him get in and start the thing up and drive around was one of the best things I’ve seen in a long time. During the drive in the 500, Otto also managed to fall asleep in the back, something that puts him in the same company as a bunch of Italian kids who grew up in the 1970s. This first event was a sort of experiment for Hagerty, but I genuinely hope they keep it up. Cars aren’t just for looking at and not touching in museums, but the chances most interested-but-not-rich-or-connected people—which is by far most people—have to do any more with a classic or collectible car is incredibly limited. Events like these can change that, and can get people and kids excited about keeping vintage cars going. If we want the community to continue, we have to reach out and evangelize, let people understand, firsthand, what the love of vintage and collectible cars is all about. I can’t think of a better way than letting people get behind the wheel, and letting kids get inside these things, to enjoy, marvel at, explore, and, yes, nap. I’m not sure what Hagerty’s plans are for future events like these, but I’m hoping they keep it up. They’re already doing events to teach kids to drive stick, so this seems like a logical progression.